For a recent appearance of hers, Pooja picked Forever New. Wearing her hair down in soft waves, she rounded out the look with jewelry from Aurelle by Leshna Shah and Swarovski, and a pair of Jimmy Choo tassel sandals. Wearing a custom Anita Dongre dress with jewellery from Aurelle, Sonakshi taped another episode of Nach Baliye on Tuesday. While I like the color, can’t say I was a fan of the frock-like silhouette. Like her on the sets look? It was Paule Ka for Shilpa while at a recent event. Updo in place, she finished out the look with a red lip, box clutch, Aurelle by Leshna Shah ring and strappy sandals. She looked good. Given the red lip color, the dress didn’t need another contrasting element… The clutch only added to visual clutter. A black box clutch (like a classic Bottega Veneta ‘Knot’) would’ve worked so much better. For an appearance at a smartphone launch in Mumbai, Neha picked a Shivan And Narresh dress. Slick hair, a pair of Saint Laurent pumps and jewelry from Minawala and Aurelle by Leshna Shah rounded out the actor’s look. She worked that dress! 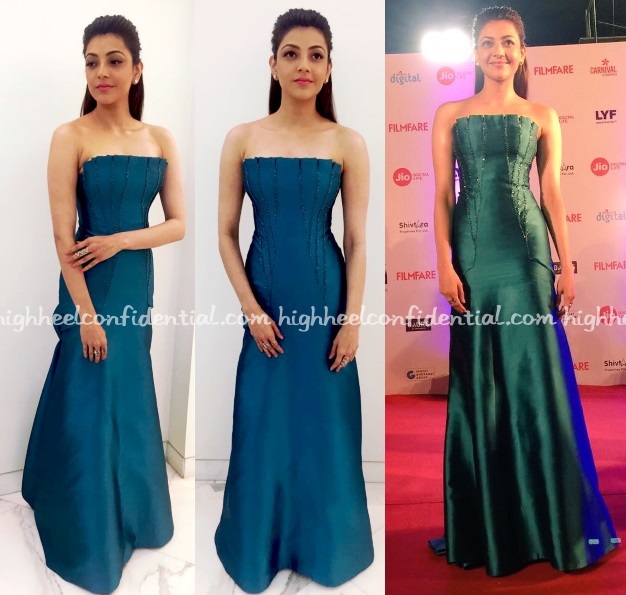 Wearing a teal Peter Langner gown with jewellery from Aurelle by Leshna Shah, Kajal attended the Filmfare Awards on Saturday evening. I, for one, quite liked the simplicity of the look.